Variability. It has been rumored for quite some time, but only now is solid evidence present to show this phenomenon: the high degree of genomic diversity of human neurons. In a recent paper in Science, the genomic diversity among frontal brain neurons is explored on a cell-by-cell basis. The results are breathtaking: up to 40% of frontal cortex neurons have altered genomic material affected by large deletions or duplications. This study provides the linchpin for a plethora of new investigations aiming to understand the impact of this phenomenon in health and disease. Postmitotic. Brain neurons are post-mitotic, i.e. a neuron that is established and wired into the networks of the brain does not undergo mitosis to produce further neurons, even though new neurons are constantly integrated into the CNS from neuronal stem cells. It has been known from other tissues that postmitotic cells may have modified genomes, including variants on the copy number level such as duplications and deletions. McConnell and colleagues now investigate postmortem neurons of the frontal cortex and various cell lines for variations on the copy number level using the highly sophisticated techniques of multiple displacement amplification and single cell sequencing. And there is a lot of variation. The dispensable chromosome 2. A plot from the UCSC genome browser on all deletions (red) and duplications (dup) that are found on chromosome 2. The sodium channel gene cluster is highlighted. It is affected by at least two independent events in two neurons. Copy number variants. 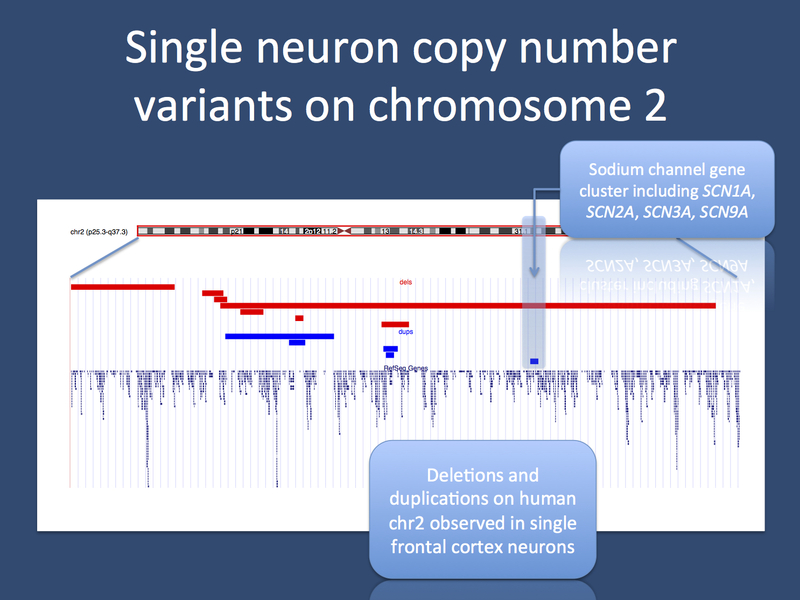 McConnell and colleagues used two basic strategies to identify the extent of copy number variations in the human brain. First, they looked at the genomic variability in neurons derived from three human induced pluripotent stem cell (hiPSC) lines. While the donor fibroblasts did not carry any copy number variants (CNVs), neurons derived from these cells showed large copy number variants in 13/40 cases. These variants included variants at the level of entire chromosomes as well as submicroscopic alterations. Intrigued by this finding, McConnell and colleagues wanted to know whether this finding is also present in neurons in the human brain. To this end, they analyzed 110 neurons from three donors and found a comparable plethora of variation. 41% of these neurons had structural genomic variants, and most variants did not overlap, suggesting multiple random events rather that a single event during development. The authors noted that most structural genomic variants were concentrated in a subset of neurons rather than being evenly distributed. In summary, their findings in postmortem human brain tissue confirm the observation in stem cells: A significant percentage of postmitotic neurons carry large structural genomic variants, turning the neuronal populations in the brain into a genetic mosaic. Single cell genome. As the methodology in the paper by McConnell and colleagues is the key point in analyzing CNVs on a single cell level, potentials issues with these technologies should be discussed. Amplification and analysis of single-cell DNA from stem cells was performed by multiple displacement amplification (MDA) followed by SNP array analysis. While amplified DNA is sometimes very difficult to use for CNV analysis due to unequal amplification of various regions, MDA seems to work amazingly well. For postmortem neurons, single cell sequencing was used, which is a reliable method to analyze diversity at the single base-pair level, but might be less robust for structural genomic variants. Nevertheless, this is the only method at the authors’ disposal and McConnell and colleagues acknowledge that some previously unexpected sequencing artifacts might be present. Using two different approaches with complementary techniques, the authors report a comparable frequency of single neuron CNVs that ranges from 15-40%. Relevance for epilepsy research. What does this all mean with respect to epilepsy? First, structural genomic variation may contribute to neuronal dysfunction that promotes seizures. For example, in two postmortem neurons, CNVs were discovered that covered the sodium channel gene cluster on chromosome 2. This region includes SCN1A. Secondly, the possible mechanism at play for this genomic diversity operates in differentiated neurons, not in cells earlier in the lineage. This means that the CNVs occur not at the stem cell level, but later during a neuron’s life. Third, many questions regarding this mechanism may remain open, as the genomic variability is not easily assessed in epilepsies that are non-lesional. Therefore, the role of this mechanism in human epilepsies may be difficult to explore. This entry was posted in 2013, Bioinformatics, Brain malformations, Epileptic encephalopathy, Ideas, IGE/GGE, Papers and tagged 15q11.2 microdeletion, 15q13.3 microdeletion, 16p13.11 microdeletion, copy number variation, genomic diversity, GNAQ, microdeletion, mosaicism, multiple displacement amplification, neuronal network, postmitotic neuron, Single cell sequencing, somatic mutation, whole exome sequencing, whole genome amplification, whole genome sequencing. Bookmark the permalink.